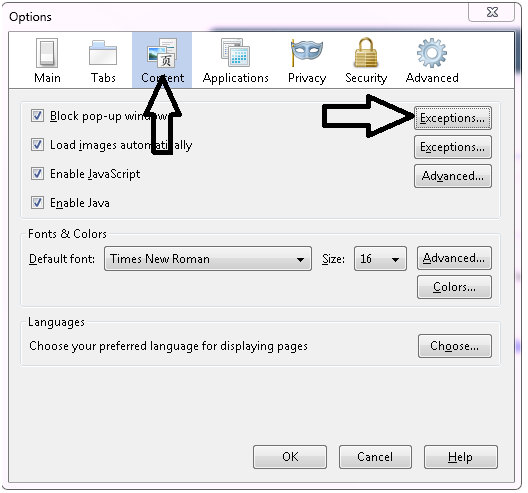 Popup blockers may help while browsing the Internet by keeping annoying advertisements from popping up on your screen, they also keep your COOLSIS Helpdesk and "Login as .." links from functioning properly because COOLSIS opens these links in a new window. 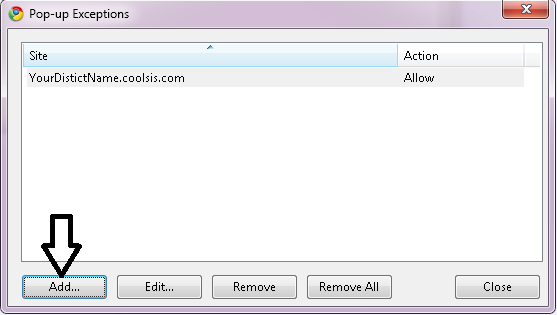 The instructions below will assist you in allowing popup windows in your browser for COOLSIS. Please follow the instructions and replace “yourschoolname” with the name your district like Technology School (technologyschool). 4. 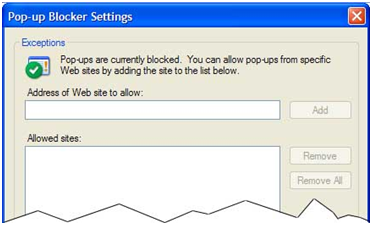 In the Pop-up Blocker Settings window, type yourschoolname.sis.cool as the "Address of the Web site to allow" and click the Add button. 5. 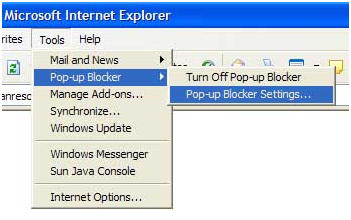 Close the Pop-up Blocker Settings window and all Internet Explorer windows. 1. For Windows, open the Options dialog under the Tools menu. For Macintosh, open the Preferences dialog under the Firefox menu. 2. Click the Content icon on the left. 3. Here you should see a check mark next to the option to block popup windows. Click the Allowed Sites button to the right of it. 5. Click OK in the Allowed Sites screen, and then click OK again for the Options/Preferences screen. 1. Open the Safari menu. 2. Here you should see the Block Pop-up Windows option checked. Click to uncheck. 1. Visit yourschoolname.sis.cool in Chrome. 2. Click the icon in the address bar. 3. Click the link for the pop-up window that you'd like to see. 4. 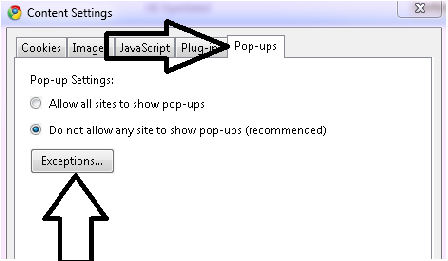 To always see pop-ups for the site, select "Always show pop-ups from yourschoolname.sis.cool" The site will be added to the exceptions list, which you can manage in the Content Settings dialog.